The Evaluation session started with the Prototype presentation. This was targeted only on the User Interfaces, explaining how and which actions can be performed with each area of interest (UserControls and Main SurfaceWindow from Implementation Chapter). The users were encouraged to experience the interface and ask questions during the presentation, in order to understand better the interaction with the prototype. The theoretical evaluation of the thesis work starts with by assessing in which measure the research questions were answered by the proposed concept. Then, the analysis will focus on the comparison of the implemented prototype’s features with the ones presented in Related work, in order to see which ones were implemented and how the prototype’s features map on the array of desired ones. The prototype implementation tries to follow as close as possible the recommended architectural patterns and guidelines. To support the argumentation, a class diagram will be presented to give a visual orientation through the prototype implementation presentation. 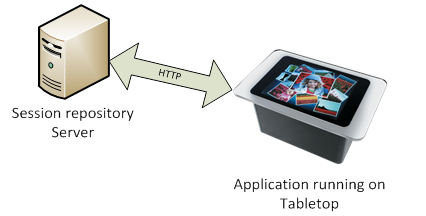 The built prototype supporting Brainstorming Sessions on Microsoft Surface, further named Breiny, was developed as part of this thesis and uses all the above framework features. is article presents the system architecture and the underlying decisions that were taken to achieve the above requirements. The system requires a repository for sessions, a repository for Brainstorming items and a native Windows application for achieving the baseline of desired features. Thus, a distributed client – server architecture is considered, exemplified here.